The Manzanita Creek Trail is rather long, the majority passes through dry, nondescript woodland, and the trailhead is somewhat hidden, hence the path sees relatively few hikers. 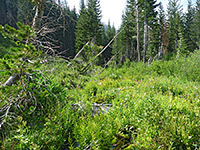 The 3.5 mile route starts in the northwest corner of Lassen Volcanic National Park, at Manzanita Lake campground, and after crossing the open woodland for about 2 miles, moves close to the creek and enters moister, more overgrown forest, where the trees alternate with meadows and marshy patches. The trail ends in a bushy area at the head of the valley beneath steep slopes on three sides, rising to Loomis Peak to the west, Eagle Peak to the south and 10,457 foot Lassen Peak to the east. The views are not so spectacular, being partly obscured by trees, though pretty enough, and perhaps the main attraction of the path is the flourishing, riparian environment around the upper portion of the creek, ideal habitat for many wildflowers. Lassen Volcanic National Park overview map; Manzanita Creek topo map. The trailhead for Manzanita Creek is not signed from the park road, in common with that for the 1.8 mile path to the Chaos Crags, which also starts in the vicinity of Manzanita Lake campground. The former path begins at the south end of the camp, in the tent section (opposite site 31), beside a parking area accommodating just two vehicles. Facilities nearby include a general store, laundry and gas station. Although the trail would appear to be little-used, the path at the lower end is wide, and shows plenty of footprints. It climbs gently over sparse, dry, pine woodland, recently cleared following a wildfire, the surviving trees now well separated. The ground is sandy or gravelly. The path leads after about half a mile into undamaged forest, still quite open, containing predominantly large, old trees, some dead, and many enveloped in thick green moss. The straight path approaches steeper slopes, bending a few times while climbing to a briefly level area, followed by a shorter ascent to a larger, mostly treeless basin, allowing the first proper views of the mountains lining the upper end of the valley. The route bears left (east) and ascends again, to a bigger, grassier plateau, where several wildflower species are found, most abundant being grey-leaved lupinus obtusilobus. Manzanita Creek becomes audible on the far side of the meadowland, though initially remains hidden behind a belt of trees to the east, until the path descends to the streambank and crosses the drainage. 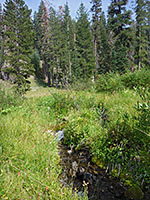 The stream flows swiftly through a narrow gully a few feet deep, enclosed by thick vegetation, so the trail generally stays some distance away. The next section of the trail climbs once more, through thicker forest, and after a while comes within sight of the creek for a second time, now running through a flat-floored valley filled with long grass and bushes. Not far beyond is a gently sloping meadow and a tributary stream, home to over a dozen types of wildflowers, before the surroundings become wooded again, for another third of a mile. The path emerges from the forest for the final time near the head of the valley, and enters a boggy area with much undergrowth. The end point is not well-defined as the route becomes harder to identify, winding through closely-spaced bushes, though it seems to continue to a slightly elevated position right beside the creek. More patches of woodland lie ahead, while to the east and west are steep, rocky slopes, crossed by several more tributaries. There are many flowers hereabouts though not much variety, and the majority of species are common. The stream can be followed a little further uphill, through the dense undergrowth makes the walk quite difficult.